A sub-type of the generally used O-rings, metric O-rings measure their thickness and diameter in metric units. They are compatible with products that use metric measurements, such as those from Europe or Japan. O-ring manufacturers and metric O-ring suppliers. Metric O-Rings – Allied Metrics Seals & Fasteners, Inc.
O-rings, including metric O-rings, are used as a seal, similar to a gasket. When one is pressed between two or more parts of a machine during its assembly, it will stop the passage of gases and liquids once the machine or system is being used. Therefore it is used as a sealant. When specifically used in this context, as a gasket between to pipes or tubes, it is called an o-ring seal. Considered one of the simplest and most important sealants on the market, an o-ring’s body can be adjusted to fit the precise measurements of a machine that requires it, making it vital to machine design. Flat o-rings and large o-rings are often customized in this fashion, since they are used for more specialized projects. The metric measurements of metric o-rings also allows suppliers to open up their market beyond the US borders, since much of the world uses the metric system and requires customized or generalized o-rings to fit the measurement system of their products. Metric O-Rings – Atlantic Rubber Company, Inc. The many applications of O-rings include pneumatic systems, pumps, and hydraulic valves. Aerospace, aviation, oil refineries, chemical processing and water treatment facilities are all industries that utilize O-rings on a daily basis. 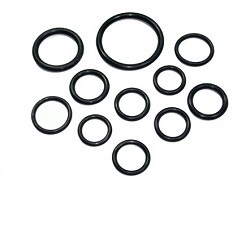 O-Ring kits are also available to provide a variety of metric sized o-rings for industries that have products or systems of many sizes. 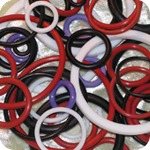 The substances used to shape o-rings were developed to respond to the needs of these various applications and industries. The rubber varieties include silicone, Viton and Teflon elastomers. Metal o-ring varieties include silver, copper, aluminum, nickel, steel alloys and gold. Often metal alloys will be used as fillers in rubber or plastic based o-rings while the same is true of plastic alloys in the metal o-rings. What substance is used for an o-ring depends on the sealing pressure, lubricant requirements, cost and size of an application needs, and each type of material has different ups and downs. Chemical compatibility and application temperature are two other factors to consider when choosing the material for an o-ring. Metric O-Rings Metric O-Rings are small, circular plastic or rubber components named for their shape and the units they are measured by.